This last week the first shipment of the Sedition Wars Kickstarter arrived at my doorstep. Sadly I haven't had as much time as I would have liked to work on it, but I did get all the extra figures from the Biohazard reward level assembled. Sedition Wars: Battle for Alabaster is a board game similar to Space Hulk in that they use 28mm miniatures on modular tiles that can be rearranged to form different battlegrounds to play in. I've not yet had time to play, or even time to assemble all the miniatures yet, but it looks like it'll be a pretty good game from the rules skimming I have done. First we have the strain, a bio experiment gone wrong or some such on Alabaster Station. (I haven't had time to read through the setting fluff. So can only go on what I've gleaned from following the Kickstarter.) 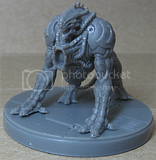 Personally they're awesome models, With nice variety in bioforms, even if each style of creature only has a single pose. The Strain have a large number of large based bioforms, the pride and joy of the spokesman for the kickstarter being the Grendlr. Which while an impressive model, is a royal pain to assemble. It starts off with the two halves of the body, which as you can hopefully see to the right (click image for larger view), do not line up what-so-ever with each other and require a near-boiling water bath to soften up one side or the other to reform it. As the halves are already deformed and deformed more to get them to fit back together, the maw bit then also needs a bath to fit on the newly shaped maw socket. There's also a design issue here where part of the alignment plug (either on the maw or on the body) needs to be removed so it has a chance to fit. The legs luckily fit in their sockets fine, though they no longer all line up where the flat parts are to connect with the base, again a near-boiling water bath fixes this by getting it's legs soft and holding each foot against the base while they cool back down. I think my favorite of the larger bioforms is the Brimstone, it reminds me of the 'dogs' from Ghostbusters. And the Scythe is my favorite of the smaller Bioforms. To fight the infection we have the Vanguard. While they have a variety of weapons, there are only three body poses (two female, one male). I'm hoping that this is due to having only assembled the Biohazard extra figures as, while I like a mostly female force, I can't really believe the Vanguard forces are 2/3rds female. One of the two female poses needs a near-boiling water bath as well as the arms are too far apart to equip the basic rifle. On the plus side I received an extra basic rifle for the female sculpt, and an extra male torso in my biohazard set. Sadly the female rifle and the male torso aren't immediately compatible so no easy extra model there, but nice anyway. Generally I'm happy so far, other then the models are in that annoying new spin-cast plastic/resin stuff that doesn't glue well, sand well, or basically do anything well. I'm guessing it's much cheaper then good ol' polystyrene. Battle for Alabaster logo used without permission from The Sedition Wars website. Biohazard reward level image used without permission from the Sedition Wars Kickstarter page. Nice overview. My Grendlrs fit fairly well, so no water bath there, but most of my Quasimodos were tilting crazily on their feet. One hot bath later they are standing up straight. Mold line removal has been challenging for me. I just don't have the technique down yet to do it fast at all. I might need to do that with mine as well, they seem a bit tippy. My first Grendlr fit better then the one I photographed, but still needed the hot bath. Tau for Sale! - Check out my army for sale on ebay!